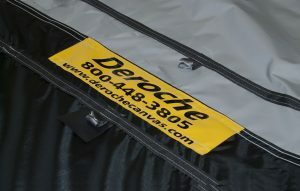 At Deroche Canvas we carry truck tarps of many different materials, sizes, shapes, and colors. In addition to the tarps available for purchase in our online store, we also can create a custom tarp just for you! Just let us know what you need, and if we don’t have it, we will create it. Our made to order custom truck tarps are produced quickly with our customers’ busy schedules in mind, but we don’t skimp on the quality material or craftsmanship that goes into each individual tarp. We can construct your tarp to fit any truck, container, or trailer that you need it to fit. Also, if you need additional customization, we can add an extra length of vinyl, an opening in a certain spot, or even your company named stenciled onto the tarp. Whether you need a custom vinyl tarp or mesh tarp for your truck we can create it for you. With our custom truck tarps you can choose what your tarp will look like, and we will make sure that it fits your truck perfectly. Our truck tarps are all made in the USA at our headquarters in New Jersey. We pride ourselves on manufacturing the highest quality product at competitive prices. We provide superior customer service to those who mean the most to us, our customers. Contact us to order your custom tarp or receive a quote.